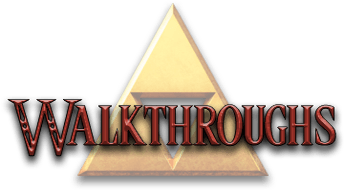 The following are walkthroughs for the original Legend of Zelda, for players who have never played The Legend of Zelda before. These walkthroughs only give step by step information for the first quest, and second quest. Version 1.0 – Created February 25, 1995. Version 1.1 – June 26, 1996. 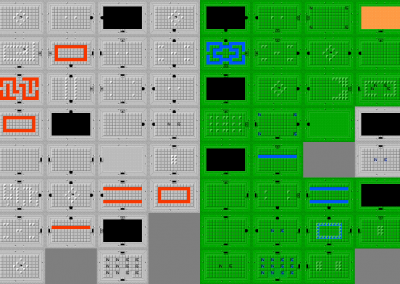 New maps and several corrections in walkthroughs. Some extra notes at the end..
other items. This is for both missions. will only look right with a monospaced font like Courier..
E WL BR #1 FF #2 $! D #7 FF AR #4 LS HC $! UP AR WL LS $. E #6 WL #2 #1 FF HC #3 $! D FF AR #5 LS $! UP AR WL LS $. Lost Hills : To get out, walk north 5 times. Lost Woods : To Get Out, Go North, Left, South, Left. middle row, second from the right. location and push the leftmost stone. Mission 1 and 2 : F16 : Use Raft from E16 to get to location. C16 : Use Ladder To Cross Platforms. Mission 2 : H 7 : Blow the whistle and enter. E11 : Blow the whistle and enter. got the boomerang (right, down, down, right) and then go right. compass. Go left and keep going left until you cannot go anymore. for the 2nd triforce piece. block frontal assults). Go left and kill the kesse for a compass. reamerging, go up 2 screens. Get the keys from amidst the puffs. heart container. Go north and get the 3rd triforce piece. Enter and go left. Kill the keese for a key. Go right then up. stairs to get ladder. Leave and go left 2 screens then go up. keep stabbing it, while avoiding the other heads and fireballs. foes or goodies in this new chambre (Let’s Call this POINT 2). screens, using candle in 2nd screen to help kill zols. Go up. with your sword. Get the heart container for killing them all. Go up for the 5th triforce piece. with the Wizzarobes (which can only be killed by sword or wand). the keese. The next up screen, race fast to avoid the spikes. gone, move the left stone and go up. More likes likes here. using the candle, and have sword and boomerang ready for combat. left. Go up, but stop right at entrance as you have found Gohma. container, then go up to get the 6th triforce piece. that splits the two sections together. (Red), Large Shield, Master Sword, 16 bombs. up, beating up the manhandlas (use the wand for faster kill). battling foes. Bomb the top wall of the 2nd screen and go up. the stairs. Go left, up and blast the right wall and go right. final piece of the triforce. likes likes and go right 2 screens (call this screen POINT 1). the wizzarobes then move the left stone and take the staircase. the patra one more time. Destroying it, go up to fight ganon. him, go up, slash the fire blocking Princess Zelda and voila! then go right for the 1st triforce piece. key and the compass and a few rupees. and then go up for the 2nd triforce piece. to you if you wanna risk your skin. meat action going to help you get the 3rd triforce piece. the top wall and pay the 100 rupees to boost bomb capacity to 12.
then 50 Rupees it will cost you (YOU LOSE) 1 Heart Container). up for the 5th triforce piece. more for the 6th triforce piece. the two trees in top-center of screen. the left, move the third stone from the top and take the stairs. left of centre across river. the stairs in this room and when you emerge, go up 5 screens. the left wall. In the new screen, go left one screen then up one screen. stone in the middle of the room the enter the stairs for the silver arrows. again. Destroy Ganon and save the captive princess again. 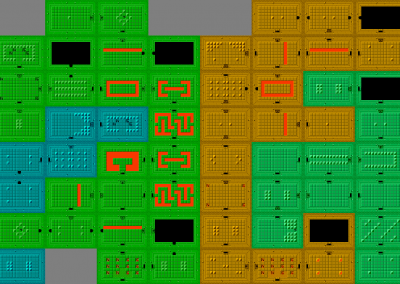 rightmost column of rooms to get to it. “eyes” of the maps. So do both level nines. 3.Levels 5 & 6 in the 1st quest have dual entrances under the knight statues. guesses what this is for? B. 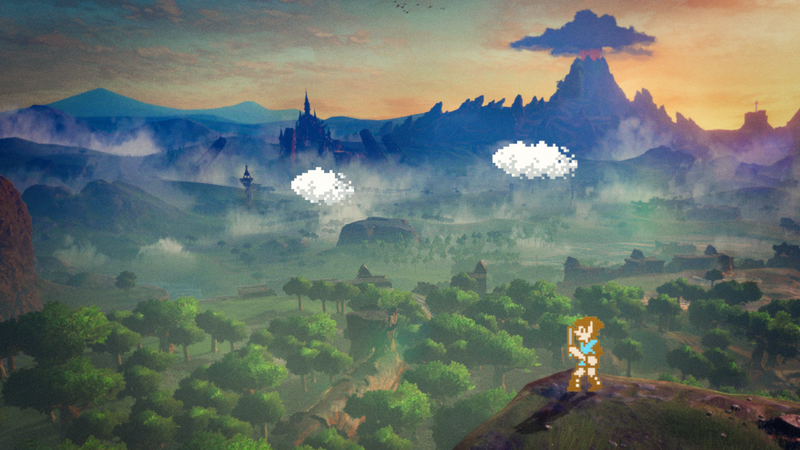 Link's Adventure begins here. D. Treasure - The Magic and the Mystery. E. What you find when you press button B.
I. Secret paths (level 9). golden triangles possessing mystical powers. 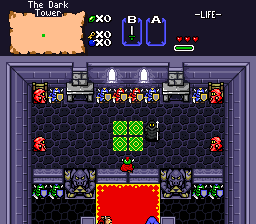 angry, imprisoned the princess, and sent out a party in search of Impa. Braving forests and mountains, Impa fled for her life from her pursuers. by Gannon's evil henchmen. Cornered! What could she do? ... But wait! henchmen, and saved Impa from a fate worse than death. way into Death Mountain where Ganon lived. Can Link really destroy Ganon and save the Princess Zelda? display appears and the demonstration begins. Press the START button. the SELECT button. Press the START button. A tird display appears. (to select a letter) and the A button (to see a letter). and then press the START button. to inflict damage on almost all of the enemy. Use buttom A for the Sword. The enemy will flash when wounded, and will be knocked backwards. There are three types of swords, each with different striking power. They are frame A at the top of the main screen. displayed in frame B above the main screen. attacks. There are some enemy attacks that Link can't defend against. the enemy's spears and rocks. The white hearts tells you how wounded Link is! are Link's life force. When all the hearts turns whithe, is Link dead. more than the yellow one. 2. Heart container and heart! rescues the fairy, she will turn all the white hearts red. 3. Key and magic key! the magic key over and over again. "A" appears when he got the key. 6. Map of the labyrinths and compass! the compass he can find out where the Triforce fragments are hidden. 7. Letter to the little old lady! show the letter to the little old lady who lives inside the cave. 8. Blue and red rings! ring reduces damage by one quater. This bracelet gives Link amazing strength. He can lift giant rocks. E. What you can find when you press button B. 1. Wodden boomerang and magical boomerang! Link can overpower the enemy with the explosive blast of a bomb. 3. Bow, and wodden and silver arrows! can only be defeated by the bow and arrow. 4. Blue and red candles! to eat it. This doesn't work for all of the enemy. spells, he can chant some fiery spells and send out flames. |  +  +  +  +      +  +  +  +  |     find a stairway. |  +  +  +  +  __  +  +  +  +  |     before you can defeat Gannon. |  +  +  +  +      +  +  +  +  |     east). (Use the shield to protect you from Aquamentus fire and hit his head). labyrinth you have to get some more rubies. eats everything, so feed him with bombs). opposition and the most of the fights are in the four darknuts rooms. In this labyrinth you can find the raft. under him to make him blow away). (Hit the twoheaded gleeok in both it's heads). 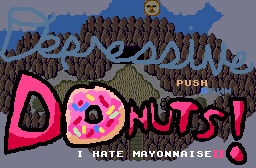 (You can find the fifth level in the lost hills. Keep going up!). (Digdogger hates music. Minimize him by using the whistle). can enter the secret path. light. Use a bomb to get the light. 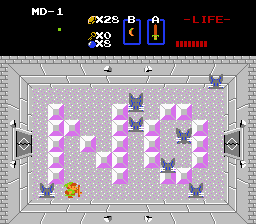 avoid so many enemies as possible on your way to the magic key. Try bombing or just walk thru walls. In the 9th. and last labyrinth you can find a lot of stairways. 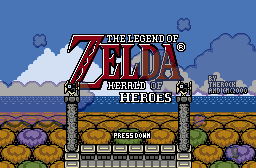 more challenging just type the name ZELDA on the initial menu. (it increases your defensive strength). paths and where they are leading to. i.e. everything I know about Zelda is in this guide. your addition, and be eternally grateful to you. .--------------------========= N  O  T  E  S =========-------------------------. "Triforce"; golden triangles possessing mystical powers. and go find a man with enough courage to destroy the evil Gannon. out a party in search of Impa. she do? ... But wait! Gannon's henchmen, and saved Impa from a fate worse than death. question. Good luck. Use the Triforce wisely. You'll know if you are in the second quest because Link will hold up a sword. ring your Link will change colors. The number on the character screen is the total of times you have died. Candles: Used to burn bushes, or to light up dark rooms in dungeons. Red - found in Level Seven, can be used "willy nilly"
Bombs: Blows up enemies, and some walls. items that other monsters drop. It can also stun monsters. Bait: used in dungeons, when a monster says "Grumble, Grumble"
Raft: used to cross bodies of water, from a dock. Flute: On the overworld summons a Warp Tornado, also annoys the Digdogger. * Get the wooden sword in the cave. enemies then you can skip the next step. your bomb on the wall to the left of the path, the 2nd tile from the right. |BBBBBBB         |               . - Bomb Here! |BBBBBB ~~~~~~~~~|     * Go in the cave and get your -=HEART=-! |            BBBB|               . - Bomb Here! |                |     * Again into the cave and get the 2nd -=HEART=-! -=LETTER=-! Now you can buy potions from the Old Woman! * Go back down the ladder and head right again. trees (that is one of the gambling places in Hyrule). hopefully, through the illusionary wall to the North. * Go in and grab your 100 rupees. revealing a staircase! Inside is 30 rupees! the lower left bush and go in to get 10 rupees! buy the -=MAGIC SHIELD=- (90). Told you we'd find a cheaper one! until the next 100 a little later, and if you're not, then kill enemies! LETTER and she will (as will every old woman in the game) sell potions. unless you have more than 210 rupees. the top bush, go in and get 100 more rupees! |bbbbb   . bb|                . - Burn Here! right bush to get 10 more, otherwise head right twice, and then up twice. -=BAIT=-, but you don't need to do that until before Level Seven. * Go right kill all the Stalfos (skeletons) one of them will drop a key. screens, kill all the enemies to get the third key. * Go to the right and pick up the compass. head left, unlock the door then head north. who says: "Eastmost Peninsula is the Secret"
key, open the door to the left. kill the Goriyas and get their -=BOOMERANG=-! key and open the northern door. * Go north, and you will be at the BOSS. Notes:  Level Two is by far the best non-"secret to everyone" way to get money. sealed door to the south. There's nothing down there so don't bother. * Go up, kill the two Moldorm (giant worms) and get their key. * Go up, kill the Goriya and get their bombs, then head north to the BOSS! him off with your trusty sword. if you have 68 saved up. * Go north take out those Zol and take their key too. bomb to the right, but head to the left instead. they steal your sword... temporarily. * Then go through the locked door to the north. north where you will find a Wise Man who reminds us to get the White Sword. * Head left and get the key, kill the Keeses to reopen the door. * Then go south twice and then through the locked door to the right. * Get the map. There's an easy way, and a harder way, to reach the BOSS. The easy way is to bomb to the right, the hard is to go down, right, up. There are 2 ways to beat Manhandla, an easy way and a hard way. * Go up 4 more times and then raft across from the dock to an island. |   _                      S - Secret! they'll leave a key, go back to the right and then up. and they become 2 red bats. get the compass, then come back out. * Go north, kill all the Keeses and grab another key. see, and then go north. key here. Get the key and continue north. enemies, go straight through the locked door to the right. bother with the door to the north, it doesn't lead anywhere. * Kill all the monsters here, and push the left stone to open up a stairway. Do not let those orange monsters (they're called Like Likes) hit you!! the -=STEPLADDER=-! You can now step across small bodies of water! that there is a little moat blocking you from the locked door to the north. the door to the north. Manhandla (Level 3's boss) to the left, so instead, go north. * Kill the monsters and push the left stone to get to the BOSS! block). Cut both of his heads off to beat him. and LEFT again to get out of the Forest. * Go down, right 2, up, and right. and leave a -=BRACELET=- behind! kill them in 1 hit, the Magic Sword can't) and get their key. certain kind of Sound", go back down and left, back to the entrance. go to the right (we've already been there!) so go up. them and the door to the left will open, and they'll leave you 4 bombs. * Go up, grab the map, come back down, and go left. and the right walls, and go left. down the stairs, you'll come out at the top of the map. * Go back to the right, then through the locked door to the south. and spend 100 rupees to increase your bomb capacity to 12. * Kill the blobs and get their 5 rupees. Wow. Go up. * Eliminate the mummies and they'll leave a key. Go up again. Sword, grab the compass and go up again. with either the boomerang or the sword. Open the door and go left. * Kill the mummies to get another key, continue left. there so don't be fooled, and take that BOSS down! their magic with your Magic Shield, and kill them with your Magic Sword. Gohma only has one eye. Return to the entrance. they'll leave you some bombs, how nice. Go up. * Kill all the blobs, and they'll leave the compass. Continue up. * You'll be in a room with a sealed door to the north, and full of bats. Kill all the bats and they'll leave a key, and open the door. Again go up. * Dash past the 3 traps in the room and go up yet again. open the doors. Go up. left wall and go that way. * Kill the monsters, and get the map. Go up through the locked door. the -=MAGIC WAND=-. Go back down, and then to the right. * You'll arrive in the top corner of the map, now go down. * Kill the 3 hoppers and get another key. Go left. have 100 rupees on hand to buy the second Bomb Capacity Increase. and get their bombs. Go up. * Bomb the north wall, but don't go that way yet, go right. * There's a Digdogger here, if you kill him he leaves bombs, continue right. * Kill all the Stalfos (skeletons) to get a key. Head left 4 times. and to the left. Then get the bombs and go left. * Kill the Keeses (bats) to get yet more bombs. Head down. * Grab the key, and head back up, then up again. through the locked door to the north. go back down and then to the right. * Killing the Goriya's here will open the door to the right, go that way. * Kill the enemies to open the door then go up again. become small. Then bomb the right wall and go right. * Kill the Moldorm, and take the key. Head left twice. trouble. Wow. Go north through the locked door. and he'll go away. Go north. * Get the map, kill the enemies, and bomb to the north. Go up. * You've found the secret! Wow! Grab the rupees, and then bomb to the left. * Kill the Goriya's to open the doors and get your 5 rupees. Go right. * Bomb right and go that way. more bombs go north and kill the Moldorm to get bombs, otherwise go right. bomb to the right and go right. * Bomb to the right, head that way and to the BOSS! Notes: Level Eight is under a suspicious looking bush in the middle of a path. * Go right, grab the key, and return left, and then left again. and get 5 rupees. Go left. Book! Return to the Entrance and go up. bomb up, and go that way. the left doors, and to get the key. Go right first. and collect the compass. Go back to the left. * Quickly bomb up (don't kill the knights yet) and go north! * Kill the Manhandla to get the Map, bomb to the left, and go that way. * Grab all the rupees, and go up. * Kill the Pols with your bow, get the bombs and bomb right. Go right. open the doors. Don't bother going up (just bombs up there), so go right. get the -=MAGIC KEY=- and then go back left and then down twice. * Kill all the Blue Knights to open the sealed door to the. Go right. the Pols with your bow, get the key, bomb up to fight the BOSS. head one by one until he dies. full bombs, adequate money supply (for arrows), and a Red Potion. and if you have passed all the other levels go up again. bomb to the left, and go that way. the tunnel. When you come out, go through the locked door to the right. they'll leave you bombs. Then bomb down again. and take the compass. Then head back up, then up again, and then right. * Kill the gels to get 5 rupees. Bomb right, and go there. by killing the smaller eyes around it first, then attacking the center. Then once he's dead and you have the map, bomb up. * Ignore the enemies here, and bomb up again. back down twice, then left, then up. go to the next room! * Kill the Wizzrobes, push the left stone, and go down the stairs. * Kill all the Zols (blobs) and go through the locked door to the left. * Kill the keeses (bats) to get another 5 rupees, yay. Continue to the left. Patra, push the left stone, and go down the stairs. 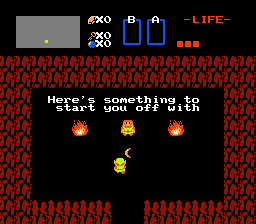 in the entire FIRST QUEST, and that is to kill Ganon! Go back down. * Then go north 3 times, ignore the enemies and bomb to the left. Go left. and push the left stone to open up the staircase. Go through the tunnel. * Ignore these enemies, and bomb the left wall and go left. * Kill all the enemies, push the left stone, and go down the staircase. * Kill the Patra, and go up to fight GANON! Ganon isn't so tough. He'll disappear and shoot fireballs at you. Arrows. Then he bursts to dust leaving his Triforce. and walk up to Zelda. 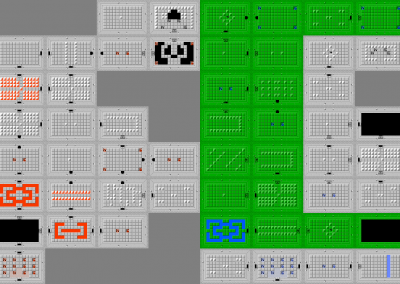 now illusionary walls, some that go 2 ways, and some only 1.
some extra keys. Never ever buy keys. PERMANENTLY), the Blue Bubble (gives your sword back), and the Electric Rope. and around the bush, and back down, and go left into the Lost Forest. don't get bombs, you'll have to buy them later. * As always its "Up, Left, Down, Left" to get through the forest. on the middle row, 2nd from the right. Go in and get a -=HEART=-. difficult spot, but try to avoid the enemies and go right. * If you didn't get BOMBS earlier, go right and into the cave to buy them. Old Man. Go down and get the letter. * We need to buy this item, at 60 rupees. First off return to the Origin. Once you have at least 60, go buy the Blue Candle. green bush, go in and get 100 rupees! Armos to reveal a staircase. 10 rupees. * Another thing that is HIGHLY recommended is to buy a Red Potion. * Go right first, kill the Goriya's and they'll leave the -=BOOMERANG=-. Go back to the left, then go up. then down 3 times, and right through the bomb hole. * Push the left stone, and go down into the tunnel. a wall)  Get the key and go left. sword, or drop a bomb. one go right, up, left, up, right 4, and then up. * Kill the Gibdos (mummies) and they'll leave a key, go up again. behind you. Go right through the locked door. * Get the compass, and go back to the left. Go up. * Get the key (you don't need to kill the Keeses). Go up again. * Kill the Gibdos (mummies) to open the door behind you, go up again. and pick up a key. Go back to the left, then go up. * There's a Manhandla here, kill him and he leaves a key. Go right. * Kill the Red Darknuts (knights) here, then go through the locked door up. * Kill the 2 Zol's and get the map. Go back down, then down again. in the second quest! ), then down the stairs to get the -=FLUTE=-! down twice, and right (you'll be in the room where the compass was). * Bomb up and go that way. Kill all the monsters here to get another key. (The Pols Voice -bunnies- take 5 hits from the white sword)  Go right. * Kill all the Darknuts (knights) to get bombs, then go down. * Kill all the Keeses to get a key, go down. * Kill all the Gibdos (mummies) to get 5 rupees. Yay. Go down the stairs. * You'll come out right under the BOSS. Kill the 3 Darknuts to get bombs. Go through the locked door to the north, and go up to the BOSS! his last head is off, he dies. is where they sell the Blue Ring at the very top right corner of the map. to reveal the entrance (just like Level Seven in the First Quest). 2 levels walkthroughs, you'll have saved up plenty of keys. ~       |               T - "Grumble Grumble"
* Go up. Kill the Goriya's here, and go right through the locked door. * There are 3 Dodongo's here, kill them and they leave you a -=HEART=-!! Go back to the left, and then up. Sword to kill. Kill them and they leave bombs. Go up. * Kill the sword throwing Stalfos to get the key, go up. on the right side to open the passage. Go down the stairs. 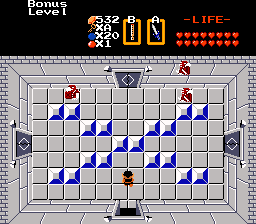 the Goriya's, and go up to get the Triforce. Since they give you a Heart, they are the BOSS. * Go left, kill all the monsters and get the key. Go back to the right. Digdoggers to open the door to the left. Go left. * Kill all the enemies to get the Compass. Go up. do touch one, then touch a Blue Bubble, he'll give you your sword back. Go right through the locked door. * Kill the Aquamentus (dragon) and continue right. the illusionary wall to the north, otherwise, DON'T!! It's a One Way Trip. ignore them, and go through the locked door to the left. * Kill the Blue Darknuts and they'll leave you a key. Go up. * The door will close behind you. Kill the zols, and go up. * Kill these Zols too, get their bombs, and go right. * Push the stone in the center, and go down. get the rupees and come back left, then up. and get the Map. Go back down, the left, then up. without a stepladder. Bomb up, and go up. * If you have 50 rupees, pay the man his rupees. DO NOT STEP ON THE HEART! * Push the left stone in the middle, and it will open up a staircase, go in. the door to the north, and go up to the BOSS! * Kill the Boss as normal, then go up, but DON'T get the Triforce yet. Instead go up through an illusionary wall to the north. * Kill the Red Darknuts to open the north door, go up. * There are 3 Dodongo's here, kill them to open the doors. Go up again. get the -=RAFT=-! 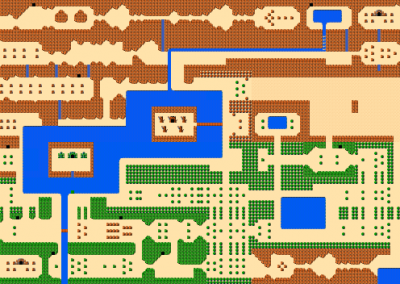 Go back down 3 times and get the Triforce. * from Level 4, go left 4, down, right 7, down, right. from the origin, go right, up 5, right 6, down, right. Notes: It would be very handy to buy Arrows before going to Level 5. * Go up, kill the Zols, and then go left. * Kill the 4 Like Likes (Shield eaters) to get 5 rupees. Go left. * Kill the Vire (they turn to 2 Keeses when hit), and get the map. that we saved up on keys?). through the wall to the right, then down the stairs. and that will open the sealed door. Go right. by a Red Bubble. Go up. * Ignore these Wizzrobes too, and go right. showing) and get the compass. Go up. * Kill the Keese, and go down the stairs. to the left, to fight the BOSS. him that much harder, however. right 2, up, right 2 and you're there. Notes: To open Level Six play the flute, and a grave will turn into stairs. * Go right twice, then down to pick up the key. Go back up, then right. * Bomb up, and go up again. Ignore the enemies and go left. and get the Map. Go through an illusionary wall up. middle row to open a stairway. Go in the stairs. key, and come back up. Go through the locked door to the right. * Kill the Gleeok, and he'll leave 5 rupees and open the door to the right. * Avoid the Red Bubbles, and push the far left stone to open a staircase. * Ignore the Manhandla and go up to the BOSS. not, you'll have to wait for him to open his eye again. times, and then up 2. * Go across the platforms on your Stepladder to get the final -=HEART=-. path and go right, and then down to get to the right side. |bbbb .b! |            . - Burn Here! it doesn't go anywhere we want to go. Go right, then right again. room, so avoid the Red Bubbles, and go right. * When you re-emerge, kill the Keeses and go down. through the tunnel. Once you're out, go right again. * Ignore the enemies (and avoid the Red Bubbles) and go up. * Kill these enemies to get the map. Go up. generous reward of 5 rupees. Go up. * Ignore these Darknuts and go up again. 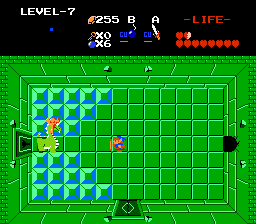 * Kill the Blue Gohma (3 arrows in his eye) and continue up. * Get the key, kill the Keeses. Push the far left stone to open the stairs. first tunnel) and go down the stairs. kill him, cut off each head. to cross, and bomb the 5th stone from the left side. _   |               :       |         T - "Grumble Grumble"
* Ignore the Goriya's and walk through the wall to the south. * Ignore the Dodongo's, and go through the locked door to the south. * Go back up, ignore the Dodongo's again, and go right. * Kill the Enemies here, then bomb the south wall and go down. on the left side of the room, and go down the stairs. * When you re-emerge, go up. Ignore the Blue Goriya's and go up again. * Avoid the Digdogger, and go up. * Give "Grumble Grumble" his Bait, and go up again. * Kill the Keeses to get the Compass. Continue up. * Kill the Blue Goriya's to get a Key, and to open the door to the left. * Kill the Goriya's to open the door to the left, and go left. the locked door to the left. * Kill the Dodongo's to open the sealed door to the left. Go left. to open the passageway. Go down the stairs. your sword in the previous screen, touch the Blue Bubble now). * Go back to the right, then down. Push the stone down, and go left. * If you kill the enemies here they leave 5 rupees. Go right. * Ignore the Keeses and continue right through the locked door. * Kill the Moldorm here, then bomb south, and go down. * Kill the Goriya's and they leave 5 rupees. Go down again. * Kill the Aquamentus here to open the door to the left. Go left. middle stone on the right to open the left door. Go left. through the locked door to the BOSS. Notes: To open Level Nine, bomb 4th from the left. the keeses, and again go through the wall to the right. * Do your best to avoid the Wizzrobes, and bomb up. Go up. Bubbles of course) and go down the stairs. * When you re-emerge, ignore the enemies, bomb up and go up. they also leave bombs. Go left. * Ignore the Like Likes and go left again. * Kill the Keese, and go through the locked door to the north. push the stone to the right, and go up. * Avoid the Wizzrobes, and go right. avoid them. Instead, bomb to the south and go down. * Kill the Zols, get the compass, and go back up. Then bomb up and go up. * Avoid the Blue Wizzrobes here, and go through the locked door to the right. * Avoid these enemies as best you can, and go through the door to the north. * The wise man here says "Go to the next room" So go through the left wall. * Ignore the Like Likes here, and continue going left. to get the -=RED RING=-  Go back through the wall to the right. * Kill the Patra, push the left stone, and go down the stairs. open the door that leads to GANON. Save Zelda Again, and CONGRATULATIONS! You've completely passed Zelda I! 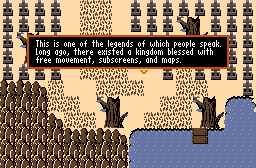 End of "The Legend of Zelda I"
Most of these secrets come from Hexar (hexar@geocities.com). die and you'll find your spoils to be four more bombs. Bonus! same time. You are presented with a menu to Continue, Save, or Retry. starting point or the outside starting point, depending on where you were. retry. Every time you win, save. Before long you will have 255 rupees. While in a dungeon, the safest place to stand is always in the doorway. in doorways and wait for Darknuts to walk by so that you can smack em. Wizzrobes because they can sometimes get you otherwise. Only attack these guys with your sword from the side, never from the back. you still have to dodge, but at least you aren't already moving towards them. one! Kill that one and your problems with multiple blue Wizzrobes is solved. and shoot fire at you. You can't kill them, however. come back in, the locked door will be open. SZVXASVK + AEVEVALG - All items for free! Questions? Comments? Complaints? Rants about the Smurfs? Email me about it! "It's a secret to everyone!" for, or in any way profit from this FAQ.